Probation services should be brought back under public control immediately in order to protect the public, Plaid Cymru's justice spokesperson has said. The system was partially privatised in 2014, but when the service was left in a "mess" the UK government decided it would end its contracts early in 2020. Private firms providing services in Wales and south-west England went into administration last week. 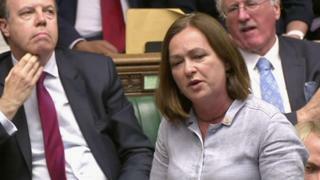 Liz Saville Roberts MP called for immediate renationalisation. The Ministry of Justice (MoJ) said it was working to arrange an "earlier transition" to the new system. Speaking on BBC Radio Wales's Sunday Supplement, Ms Saville Roberts said the overhaul announced last year would see Wales rid of privately-run probation services when contracts ended next year. She called for the process to be fast-tracked, following the collapse of the Working Links community rehabilitation companies (CRC). "Surely we should be bringing back probation into public control in Wales," the Dwyfor Meirionydd MP said. "Surely this should be done now." Ms Saville Roberts claimed the "profit motive" for private firms of keeping offenders out of prison put the public at risk. She used the example of Conner Marshall, from Barry in the Vale of Glamorgan, who was murdered by David Braddon at a Porthcawl caravan park in March 2015. Braddon was being monitored by probation workers after being convicted of drugs offences and assaulting a police officer when he murdered the 18-year-old. "Conner was murdered four years ago by a man who was on probation, being supervised by Working Links," she said. "We know that the murderer of Conner Marshall breached his probation conditions eight times. "We know in the majority of these times, what he had done should have been sufficient to send him back to prison." The MoJ said that Seetec, the parent company of the Kent, Surrey and Sussex CRC, would take over delivery of probation services in south and west Wales.